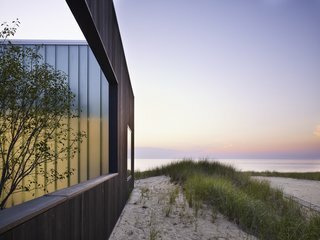 Set on a sandy bluff overlooking the shores of Lake Michigan, a modern home has been inspired by its magical setting. 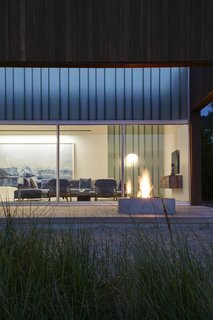 Chicago–based firm John Ronan Architects has recently revealed one of their latest projects: a single-family residence known as the Courtyard House. 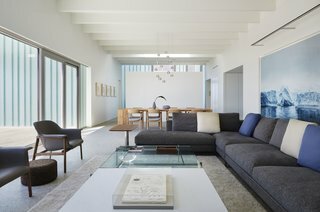 The 5,000-square-foot contemporary home is organized around a series of four courtyards, hence the property's name, and consists of indoor/outdoor living spaces to provide privacy and shade. 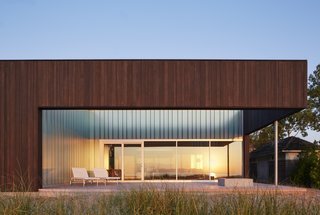 The exterior of the home is clad in charred wood siding, which pays homage to summertime bonfires on the beach. "This project explores spatial complexity through the studied arrangement of interior and exterior "rooms" and their relationship with the site," explains one of the architects. 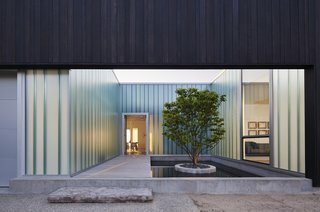 The home is organized around a series of four courtyards. 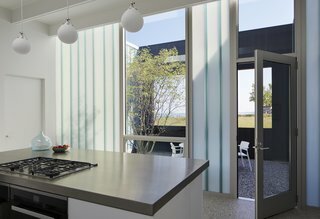 The site has had a strong influence on the home's material choices and color palette, both of which have been inspired by the lakefront setting. 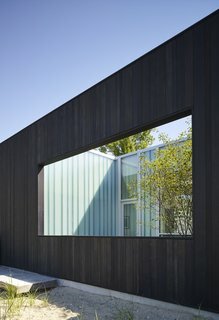 Charred wood siding references the beach bonfires common in the area, and the use of channel glass in portions of the facade refer to the green beach glass that washes up on shore. Directly east of the kitchen is a dining courtyard, which receives beautiful morning sunlight. This area is also shaded from the western sun in the late afternoon. The strong sense of place starts as soon as you approach the house, as visitors must cross a "bridge" over a reflecting pool to enter. 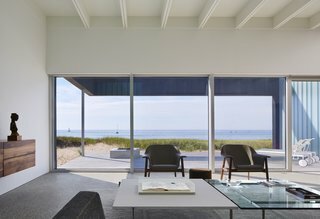 Once inside, guests will be embraced by a double-height great room that frames gorgeous views of Lake Michigan. The open-plan living and dining area features a bright, expansive sense of space thanks to the wall of windows and the spectacular surrounding views. 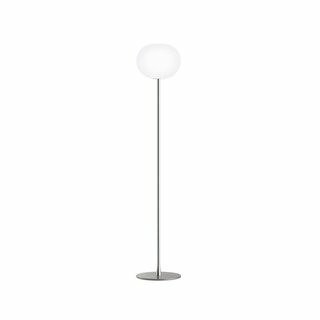 The Flos Glo-Ball Floor Lamp was designed by Jasper Morrison with elegant, modern simplicity suitable to any contemporary interior. 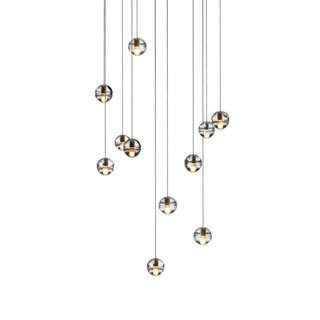 The careful craftsmanship of the blown White glass shade is fully revealed--and enhanced--when illuminated. It is recommended to mount transformers remotely in a close, accessible and hidden location for ease of long term maintenance. A look at the living room looking toward the dining area. The awe-inspiring view of Lake Michigan. This exterior deck is partially closed and is oriented to take advantage of lakeside vistas. It also allows sunlight into the study and master suite. Together, the four courtyards create private outdoor space and strategically screen views of the adjacent houses to preserve the feeling of isolation. 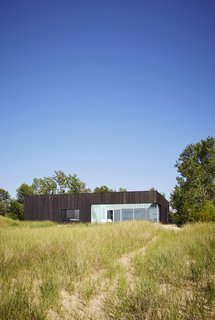 Materials such as sand, stone, and driftwood have been inspired by the lakefront site. Here is a look at the colors of the beach at dusk against the charred timber exterior. A fire pit allows the experience of beach bonfires without having to leave home.